The playwright Somerset Maugham bought this around 1912, after a friend spotted it in a shop window. It was the first painting in his very fine collection, now divided between the Holburne and the Theatre Royal, Bath. 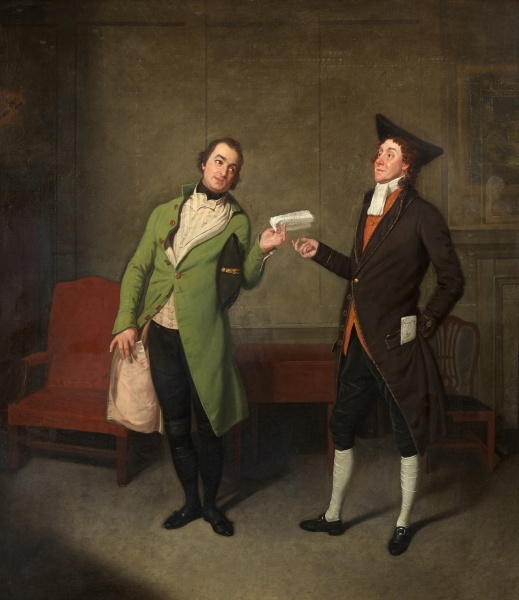 The scene is taken from a one-act comedy by George Colman the younger. Two men are waiting to meet a theatre manager: Daggerwood, the stylishly-dressed actor on the left, and Fustian, an old-fashioned tragedian. The actor reaches into the pink lining of his coat to hand out an invitation to his forthcoming show.